2015-06-10 - Now Look Who's On Top! After another fantastic night of trivia, we have a new leader in our PubGuys Trivia League standings. If you're not familiar with the league, you can read all about it here. Simply, if you're already playing trivia, why not put those hard-earned points to work? With the help of some Geekdom questions, Brews Your Daddy completed the sweep on the night and catapulted themselves into the top spot in our league standings. Though we did have a clean sweep at the top of the leaderboard, there was quite the battle for second place. In the opening game, we saw the Sodomatic Weapons take second place and the gift card. For the Power Hour, it was the almost triumphant return of the Loyalty Thugs taking home second. 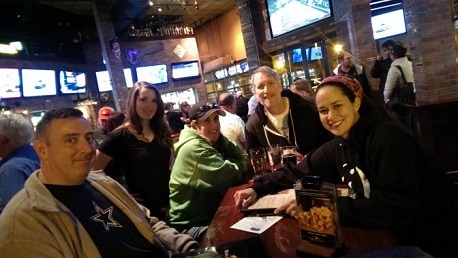 Easily one of the best parts of the night was the return of one of our favorite trivia players, Amber. She's been missing trivia so much since moving to Florida that she came all the way back to Texas just to get her fill. We're only sad that Brian wasn't able to get into town in time to join us. Hopefully we'll soon be starting up some PubGuys trivia at a World of Beer in Florida (we hear they have a few of them around there....). Thanks to everyone for coming out! Be sure and follow on all the major social networking sites, and make sure you're already signed up for the league. There are just a few weeks remaining, so don't miss your chance to win some cash!